Are you are a woman thirsting for a one on one support in recreating your sacred business? Trust me, I know what it's like to try and figure out how to create my business from the ground up. I had a vision, a big one and I needed to figure out how to put all the pieces together. Support is a really important part of the process. I was so anxious to 'get it together' that I enrolled in every high end 'formula' program out there. 35k later, I realized that NONE of those 'formulas' worked for me. I am not a formula kind of gal. I am a highly intuitive, think outside the box, everyone is unique kinda gal! So then I hired high end Coaches to help me get my biz off the ground, and I got more 'formulas' for an easy 30k. What I learned from this time consuming and expensive process wasn't any 'new technique' but rather that there is a different kind of business woman out there. One that is highly intuitive, sensitive, smart, who see's things really, really differently than most and that formulas don't apply to her - that women is me. I had wanted support and someone I could ask questions with and someone that could help me give practical advice with her intuition, heart and soul. I didn't find that with those fast talking business coaches. I found it when I tuned into myself and took things out of the boxes they were put in. That is when I really started to fly. With new confidence, new knowing, and the realization that I what I wanted was something that I really needed to create for my clients. Because my clients are so unique, so magical, so outside of the box that they never quite fit in. They are visionaries and need support from a visionary. That's where I come in. I created Business Activation for the women that knows she doesn't fit in a box..and could use some support with her wild woman vision. 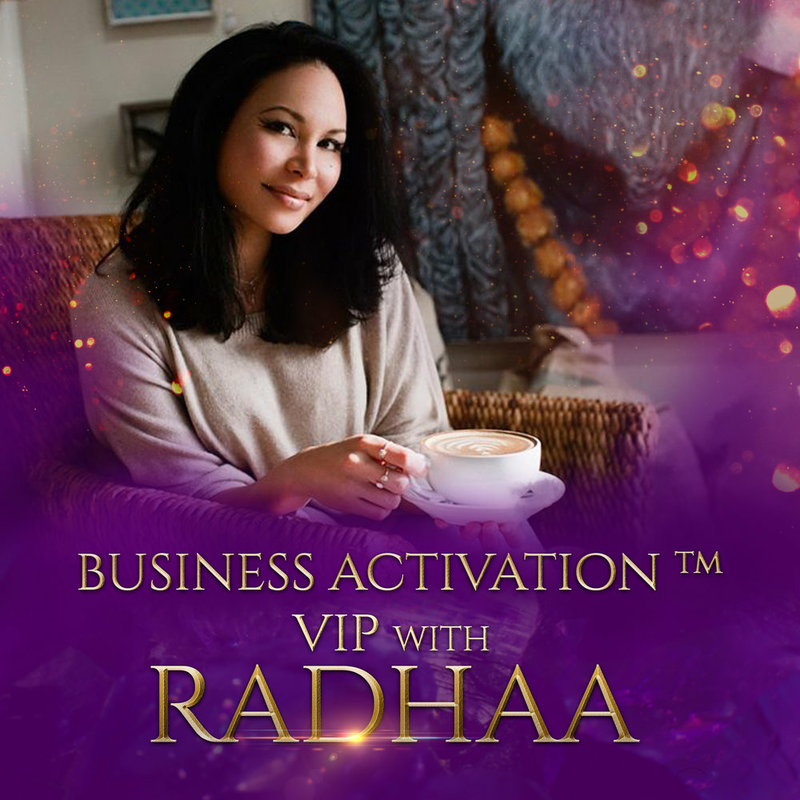 The Business Activation is a VIP weekend of diving deep into your business wether we are creating an idea you have over a weekend, or reworking your business that you already have. You will feel inspired with a Business Blueprint that we map out together. I tune into you and we start clearing blocks that are holding you back. Then we dive into logistics. It gives you crystal clarity so you can start to feel in harmony with what you are creating. You don't have to struggle to bring your vision to life. Through the process we celebrate the visionary that is you, completely realigning your mind, body and soul to your Business. Imagine waking up Saturday morning with your day free and clear. whatever it is you are ready to work through. and three hours on Sunday. Sunday night you will be filled with clarity and a set plan to move forward with your Business! As women who are natural givers tend to forget ourselves, our compass and all the gifts we have to offer. We’re always looking to the masculine or our partner to fill us. The Business Activation is an intimate, two-day retreat that we will share with each other, melting away and releasing all that is not of you, and showering yourself with all that is you in your Business. We will finally be able to access your authentic voice they may have been drowned out in the crowd when you tried to fit in. When you come to me, I will hear you out in every way - and my gift is seeing other's gifts and strengths. We activate that within you so you can show up Powerfully in the world. This can be done virtually and in the comfort of your own home. We start with a sacred ceremony, where we set the intentions for the day, and manifest all that you want to achieve. Then, we start the work with a deep clearing in which you can bring in any of your issues. I will guide you through a Shamanic journey to remove any blocks, old beliefs and negative patterns. Before we start working through your business plan we invoke the Self Love Activation. Here, you will learn to experience the deepest love for yourself so that you can give to yourself fully through this weekend. No more self-sabotage! You will be fully supported with healing, and graduate to a higher frequency that you can come back to. This is a heart, mind and body experience with tangible action plans you can put forth in your life and business! It's time to say YES to YOUR SUCCESS!